Textkernel’s tools help you accelerate business development by finding the best candidates faster and matching your available candidates to all other jobs — both in-house and on the market. Powered by multilingual resume parsing, semantic search, sourcing, matching and lead-generation tools, Textkernel helps you to increase your placement numbers and grow your revenue. 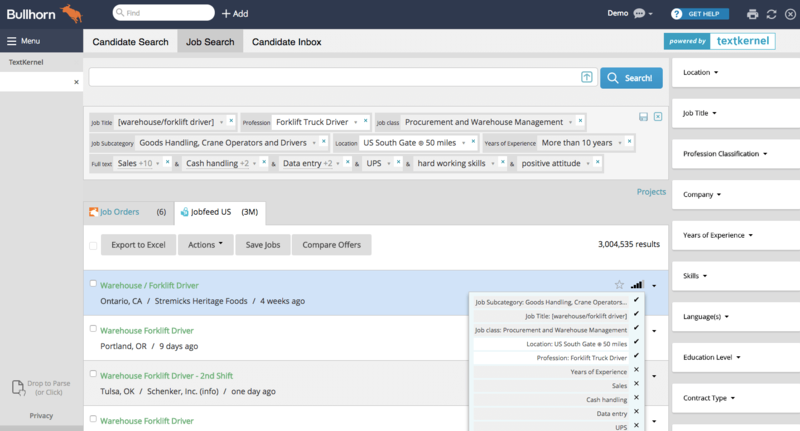 Textkernel’s semantic candidate search helps you find more quality candidates faster. Semantically means that you find what you are looking for, not just what you type. You won’t need to come up with synonyms; the technology does this for you. A two-word search instantly becomes a 20-word search; turning every recruiter into a sourcing expert. External databases: You can also simultaneously search external databases, such as job boards and social media. You only need one search to find the best candidates from different sources. Use your job ad to get candidate recommendations from Textkernel’s semantic matching technology. 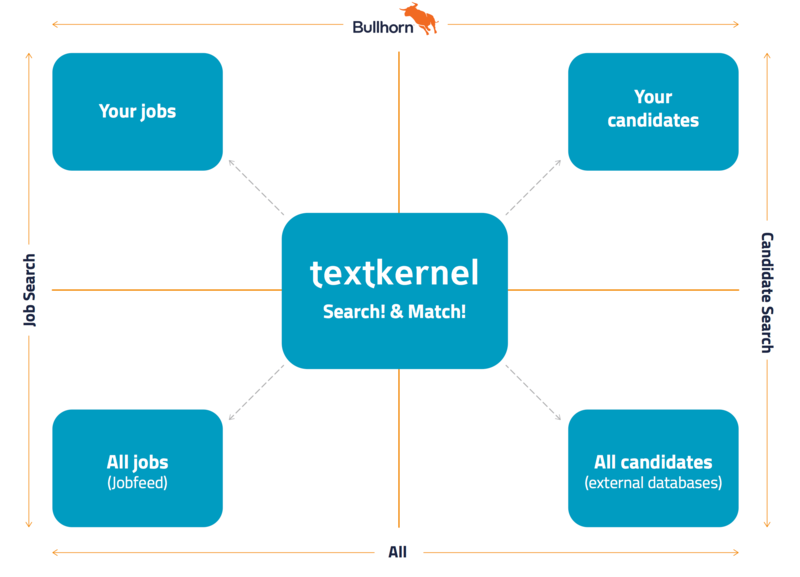 Textkernel’s technology in Bullhorn automatically transforms your job requisition into a search query and presents you with a shortlist of matching candidates. 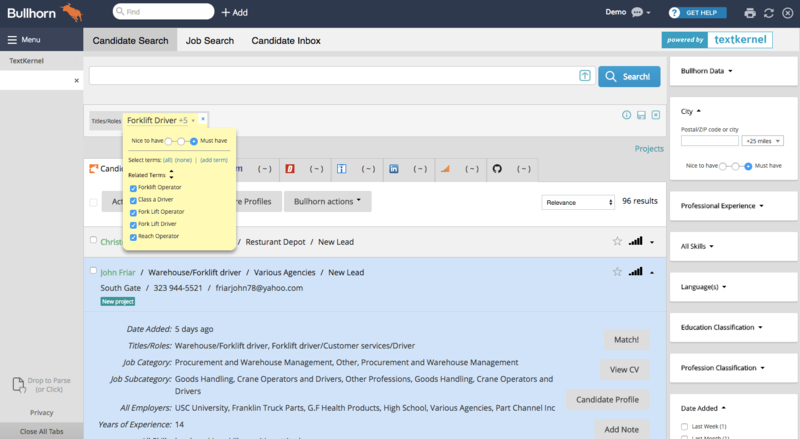 You can also match a candidate profile to your jobs in the same interface. By leveraging your own data, you can make placements faster. Get more out of your sourcing efforts! Match your number two, three and four candidates to all direct employer jobs in the market found by our lead generation tool, Jobfeed. Jobfeed collects and categorizes online job ads, distinguishes direct employers from agencies and makes them searchable. This allows you to identify interesting job opportunities to place your other candidates. Find what you mean, not what you type. Textkernel offers semantic search; searching by meaning, not plain keywords. By parsing both resumes and jobs, Textkernel’s technology can understand the concepts and provide the best matches. The keyword CEO in a resume it does not automatically mean they are a CEO, but they could have worked for a CEO. Textkernel’s technology can understand these types of differences. In addition to automatically offering synonyms and related terms, Textkernel’s semantic search software considers your own preferences and will let you find what you mean. You can add your own synonyms and select which related terms are of interest to you. You can also create your own categories (e.g. your customers or prospects). The software will automatically remember your preferences, saving you even more time in your next search. The intelligent software can also search in specific sections of a resume. When you type in Java, Textkernel’s smart software will auto-suggest types: are you looking for a skill (Java) or maybe a previous position (e.g. Java developer)? This way, you are more likely to find the most relevant people. Textkernel’s intelligent technology is wrapped in a user-friendly interface that allows you to view and adjust the search & match criteria and weighting at any time during your search, compare candidates and create projects. You will be able to find the best candidate in your database right away, with no technical training required. Recruiters will love it! With an extensive database of job titles, professions, and qualifications, Textkernel’s semantic software automatically offers you synonyms and related terms, increasing your chance of success. Your recruiters won’t need to be Boolean or industry field experts and still receive relevant search results. No suitable candidates in your database? No problem. Textkernel’s software will simultaneously search external databases, job boards, and social media such as LinkedIn, CareerBuilder, Monster, Indeed and Dice so you can always find the right candidate.